This composition for solo tuba forms part of Francis Schwartz’s “Literary Bagatelles” ; a body of music-theater works inspired by literary creations of such authors as Thomas Mann, Miguel de Cervantes, William Shakespeare, Rosario Ferré, Edgar Allan Poe and Cormac McCarthy ; as well as paintings and sculptures by Anselm Kiefer, Francis Bacon, Max Neuman and Melquíades Rosario-Sastre. “The Grey Road” explores the dark, forbidding atmospheres that permeate Cormac McCarthy’s writings and Anselm Kiefers large pictorial works. Schwartz utilizes unconventional performance techniques that include histrionic elements to establish a tense, brooding ambiance evocative of a tortured world. “The Grey Road” ideally is to be executed in a claustrophobic, space where aromas and temperature manipulation can be utilized as an integral part of the score. This approach forms part of Schwartz’ four decade strategy to maximize audience participation in an Artwork by employing multi-sensorial provocations. The public is not meant to be passive consumers of the “The Grey Road” or the other bagatelles. 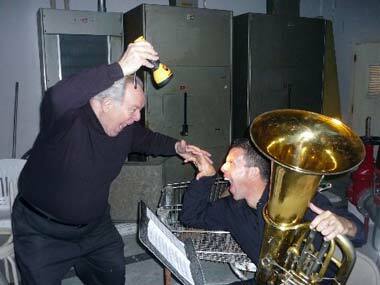 The 2009 video, in which the distinguished tubist Jay Hunsberger performs “Grey Road,” was created in the machine room of an urban condominium building, supervised by the composer Francis Schwartz and filmed by the video-artist Justin Spring. - - John Cage's 4'33" is a herald of the lightning, and a heavy drop out of the cloud: the lightning, however, is Francis﻿ Schwartz's Concerto for Solo Conductor. LOL. to initiate a project to make Francis Schwarz's music theatre projects widely available. 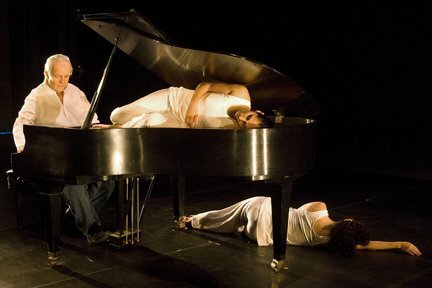 This work, which Schwarz performs at the piano, to a powerful wide-screen filmed accompaniment, is a musico-political treatment of André Chénier, the revolutionary great French poet who wrote the famous Ode à Marie-Anne-Charlotte Corday, and a final poem, La Jeune Captive on his way to suffer 'serious corporeal alteration' (Schwartz) at 32, just before the end of the Reign of Terror. The Headless Glory was composed for the French Revolution Bicentennial celebration, premiered in Caracas and taken to the Sorbonne in Paris and around the world. It is a powerful piece which must have gone down well in the right concert setting, and it will hopefully be brought together with others of his challenging works to make a commercially viable DVD. 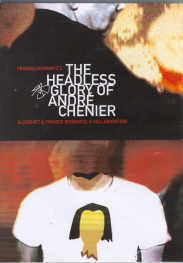 Meanwhile, perhaps Bleushift will make The Headless Glory of André Chénier available on their website? Schwartz states," I believe in the active communion between the professional musicians and the attending audience." Francis Schwartz at Miami Festival "Corruption! Malebolge! I can steal and wheel and deal. . . and NOTHING happens to me...ha, ha, ha..."
"Nine Composers in Ninety Minutes"
The November 12th concert of Florida International University Music Festival was a good idea that turned into 180 minutes of uneven interpretation of American contemporary composers. For those of us who endured the three hour marathon, the second half of the program proved to be a rewarding one. The lack of program notes forced the interpreters to supply the public with essential information, breaking the performance rhythm and adding unnecessary minutes to the program. Some of the comments were brief, yet others became wandering , irrelevant dissertations. The clean, lyrical interpretation of Aaron Copland's Nocturne by Robert Davidovici (violin) and Jose R. Lopez (piano) was the highlight of the first part of the concert. A selection of 3 songs by Charles Ives became a lackluster one as result of the tenor's, Robert D. Dundas limited vocal projection. John Cage's Solo for Sliding Trombone by Mark Hetzler lacked the seriousness and respect Cage intended when composing his work. Instead of a serious philosophical journey, clownery dominated the interpretation. To close the first half, the Miami String Quartet performed George Rochberg's Quartet No. 5 . This 30 minute work proved exhausting for the already antsy public who had already consumed 65 minutes of music. The second half started with half the audience and Orlando Jacinto Garcia's imagines (sonidos) sonouros congelados for violin. An interesting piece that requires the performer to play against a tape and move around the stage as the work progresses. Garcia achieved moments of subtle poetry. Libby Larson's apocalyptic Jazz at the Intergalactic Nightclub followed. Frederick Kaufman's world premiere Inner Sanctum, beautifully performed by renowned bass clarinetist Henri Bok, provided the public with a spiritual and peaceful oasis that sharply contrasted with Larson's end of the world prophecies. The Miami String Quartet interpreted Walter Piston's Piano Quintet with great professional expertise. The concert closed with Francis Schwartz's Malebolge Eternale, a political music theater work for pianist-actor. In blunt Dantean tradition, Schwartz castigates contemporary corporate rapaciousness and political chicanery using the performer's denunciatory vocal line while inviting the public to produce sounds at specific moments in a clever counterpoint of condemnation. Schwartz's choice of Dante's Inferno was appropriate on this occasion, for many reasons. The audience relished this opportunity for social protest and enthusiastically followed the dictates of performer Francis Schwartz who skillfully built dramatic tension while injecting moments of humor. To hear the public hissing the name of a well known brokerage firm recently condemned for illegal practices, brought to mind the world of Kurt Weill and Bertolt Brecht, but with a zany, imaginative 21st century promotion of social change. The new energy in the concert hall was most refreshing and provided a powerful close to the 3 hour marathon.